Yesterday I was at Sunridge Mall which is just happens to be pretty close to where we live. I’d been there last week to check out their Christmas decorations, but they hadn’t put them up yet. They have been using the same Santa’s Village for many years now, and it is magical. There is Santa’s workshop covered with snow in a forest with different cartoon animals (animated and stationary) perched all around the area. The workshop is decorated with candy canes, gingerbread men, wrapped presents and any number of tree decorations. 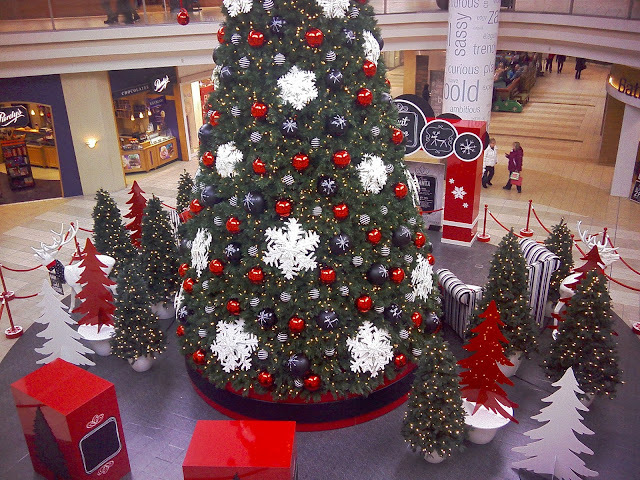 When you looked at this display in the centre of the mall, you knew that Santa and Christmas are just around the corner. Yesterday when I checked out the centre court, they had managed to set up the Christmas display. Gone was Santa’s workshop, the cartoon animals, the candy canes and gingerbread men, the presents and decorations. In their place was a large, stylized green Holiday tree decorated with large snowflakes, red and blue balls and white lights. Surrounding the large tree were smaller trees with lights and red and green trees cut out of cardboard and a couple of red boxes which I suppose were meant to represent gifts. At the edge of the area there was an over sized black and white striped love seat where Santa will receive the kiddies. I know that the malls like to change things up every now and then, but wouldn’t it have a certain continuity if you could have your kid’s pictures with Santa in the same workshop that you had your picture with Santa taken. The mall seems to have bought into the modern, Madison Avenue version of Christmas that is all white and silver with an empty starkness about it. I don’t think they get Christmas at all. Perhaps they have been swayed by those that are saying we shouldn’t celebrate Christmas because not everyone are Christians. That’s very true, and if it were strictly a religious holiday I might agree. The fact is that it is more than a day to celebrate the birth of a religious figure, or to perpetuate a beloved myth, Christmas is the single most important time of year for a large part of the worlds economy. The toy makers of course, clothing, electronics and pretty much all manufactured goods. The travel industry does a fantastic business getting people home for the holidays or getting them somewhere warm for the holidays. The energy industry supplies fuel for heating, travel and shipping around the world. The restaurants and bars are full for months with booked Christmas parties, not to mention people going out to eat. Grocery stores can’t keep food or goodies on the shelf. Oh, and all of those countries or peoples that aren’t Christian, don’t seem to have a problem manufacturing and selling goods. In fact, I would bet they are more than pleased to supply the needs of Christmas. 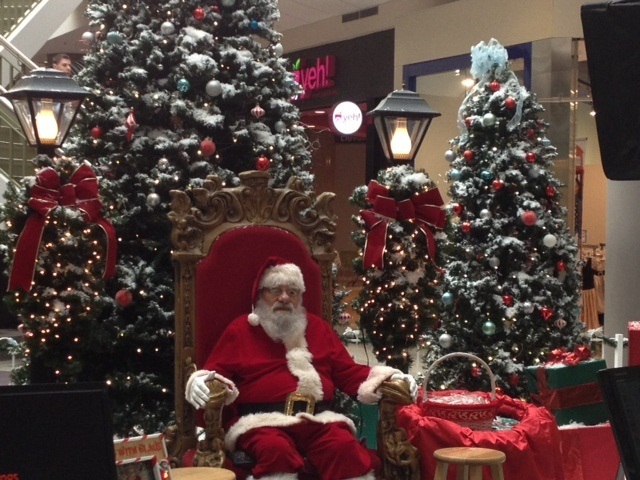 I suspect that the person or committee that designed the new Santa`s court at Sunridge Mall are not big on Christmas. I would wager they are the people who complain that they get sick of holiday music and wish that the stores wouldn`t advertise so early. Personally, I think that the person in charge of decorating a mall should speak as a child, understand as a child and think as a child. They should be adult enough to be a big fan of Christmas or at the very least understand just how important it is to our children and economy. They should embrace the magic of Christmas!